At Kira Doyle Law, we say that estate planning is life planning. It is planning for how your wishes will be carried out during your lifetime and after your passing. It is planning for how your assets are distributed after you pass and making sure your loved ones are receiving what you intended. However, if you have delayed the completion of your estate planning documents, your assets may not be protected in a way that ensures the distribution of your assets is done in accordance with your wishes. A common misconception is that only those with many assets, or wealthy individuals with money to be distributed after they pass, need estate planning documents such as a Last Will & Testament. This is simply not true. No matter the amount of assets you own or their value, and no matter your net worth, we recommend everyone have a Last Will & Testament! Having a Last Will & Testament in place can help streamline the probate process, saving your loved ones time, effort and potentially prolonged heartache in closing up your accounts and distributing your remaining property. Even if you do not have any assets with monetary value, chances are you do have assets with sentimental value. You may also have a loved one in mind who you would like to receive this asset upon your death. Think about the items you own. Do you own your late grandmother’s china set and do you want to ensure your daughter receives it? Do you have your great grandfather’s possessions from when he was in the military, and do you want to make sure your son is the recipient of these items? A Last Will & Testament is for assets big and small, that carry different kinds of value. The Last Will & Testament is a legal document that will not only tell the probate court how you want your property distributed, it will also name the person you would want to have the power and responsibility to wrap up your affairs. This person, named the “Personal Representative," will have the authority to gather all of your property, pay any valid creditors’ claims and distribute your remaining property in accordance with your wishes as set forth in your will. If you have previously thought that a will was not necessary for your estate planning process, we hope you will consider the importance of this document and the implications that dying without a will in place may have. 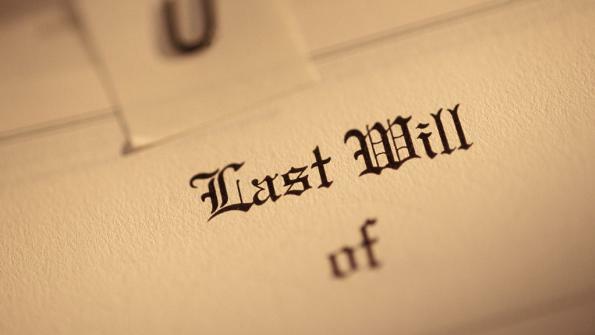 What Really Happens When You Die Without a Will in Place? With or without a will, the probate court may be involved after your death. If you die owning assets in your individual name, that were subject to a designation of beneficiary provision, those assets will have to be distributed through the Probate Court. Probate is a legal proceeding wherein the courts assume jurisdiction over your individually owned assets, distributing those assets either in accordance with what is written in your will or according to Florida intestacy laws. When property is distributed by manner of passing through intestate succession, the result may end with your assets being distributed in a way, and to individuals, that might not be aligned with your wishes. Without a will, the probate court will distribute property in a way that they assume the average person would have designated their property be distributed to heirs-at-law. Heirs-at-law can include spouses, children, parents and other relatives. The intestacy laws do not take into account a strained relationship, and do not make exceptions for close friends who are like family members. The probate process can be costly, complicated and time-consuming. We’ve found that most probate proceedings take between four to twelve months in Florida. There are some circumstances in which probate is not necessary. Probate proceedings may not be necessary depending on what assets the decedent owned and how they are titled. If there are assets that are titled in the name of a properly executed and funded trust, these assets would not need to go through probate because they are not considered assets of the estate. Once you die, your revocable living trust becomes irrevocable, meaning the terms cannot be changed and your wishes for the distribution of assets will be honored. Also, any beneficiary designation, such as a payable-on-death or transfer-on-death designation, does not need to go through probate. This is typical for life insurance and retirement accounts, as well as other financial accounts, like standard bank accounts. Probate may not be necessary for property if the property is titled in a certain way, either jointly owned with rights of survivorship or by tenancy by the entirety, as these real property titles ensure the property passes automatically to the surviving owner. Probate is not required if all the assets owned by a decedent are non-probate assets, as described above, because they are set up in such a way to automatically pass to others, without the need for a probate proceeding. Get a head start on the probate process today so your loved ones can avoid undue complications during an already stressful time. Our estate planning process is a complete strategy that applies during your lifetime and after your death to ensure that your family and loved ones are cared for in the way you would like. Ask a St. Petersburg Estate Planning Attorney for Assistance! The estate planning process does not have to be complicated or scary. The experienced estate planning attorneys at Kira Doyle Law will personally and professionally guide you through this process so you can ensure your assets are protected and you have a plan in place that best protects yourself and your family. Start life planning with us by calling our St. Petersburg office at 727-537-6818 to schedule an appointment with our experienced estate planning attorneys today!